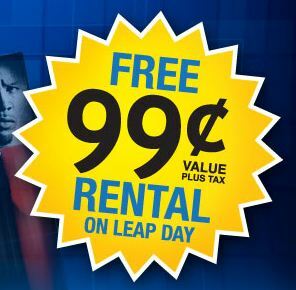 In honor of Leap Day, Blockbuster is offering a printable coupon for a FREE 99¢ DVD rental! Click on Get My FREE Rental at the bottom, left corner to print your coupon. Then head into your nearest Blockbuster store to get a FREE 99¢ one-day movie or game rental. Heads up, this coupon expires 3/5 and is not good at Blockbuster Express kiosks. Check out Movie Kiosk Codes for more free rentals.